Easter crafts with kids are so much fun. I love everything from dyeing eggs to decorating baskets. There is no shortage of cool crafts, especially the kind that involve chocolate. Since salty-sweet chocolate-dipped pretzels are one of our all-time favorite snacks this year, we made this cool pretzel Easter egg nest. They only require two ingredients, and then you can fill them with the candy eggs of your choice. In this instance I used crunchy dark chocolate eggs, but foil-covered eggs or jelly bean eggs would look really cute as well. This simple craft is good for kids of all ages. Have fun making them and don’t forget to leave one for the Easter bunny! Get the easy recipe for my family's all-time favorite Easter snack. Step 1: Lightly spray the inside of 12 muffin cups with cooking spray. Step 2: Place the chocolate chips in a microwave-proof bowl and heat in short bursts until the chocolate can be stirred smooth. Fold the pretzels into the chocolate carefully and mix slowly until the pretzels are coated with chocolate. Step 3: Scoop even amounts of the chocolate mixture into each muffin tin and press down lightly. Use your finger or the back of the spoon to form a little well in the middle. Slide the muffin tin into the refrigerator to harden for at least 1 hour. 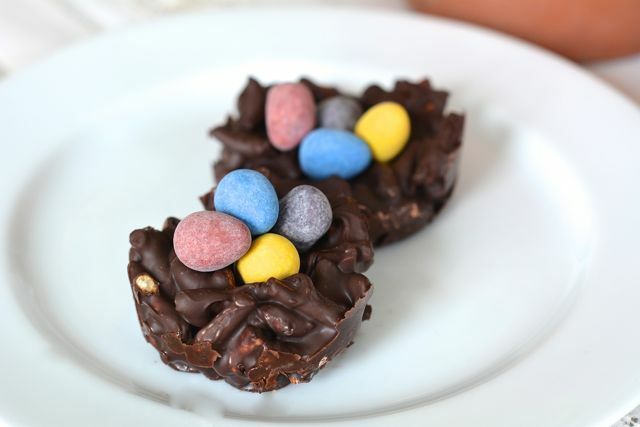 Then, pop the nests out of the muffin tin and fill each one with candy eggs. Enjoy!